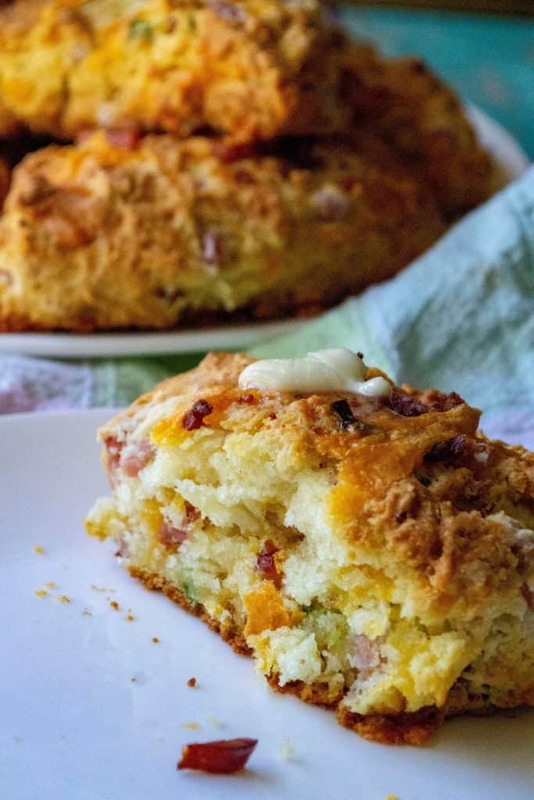 Ham and Cheese Scones are the perfect savory scones you have been looking for! 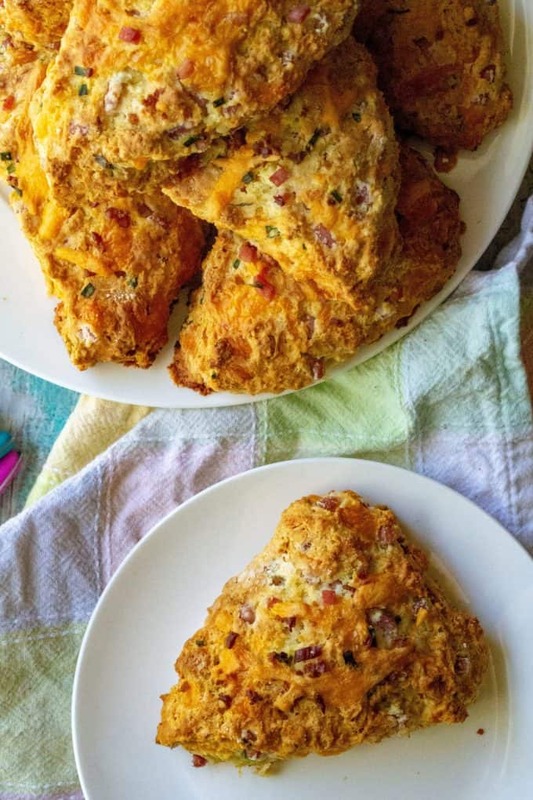 Made with tons of cheddar cheese, crispy bacon, tender ham and chopped chives, these Ham and Cheese Scones are the perfect easy brunch idea any day of the week. ARE SCONES HARD TO MAKE? Now, I will admit that I always thought scones were hard to make and took forever to bring together. Nothing could be further than the truth, breakfast scones are simply mixing everything together, forming your dough into a circle, cutting them out and popping them in the oven for 20 minutes. No fancy utencils needed, no special mixers or cutters… just a regular mixing bowl and your two hands. WHAT DO YOU SERVE WITH SAVORY SCONES? Usually breakfast scones are served up with jams, perserves or lemon curd. 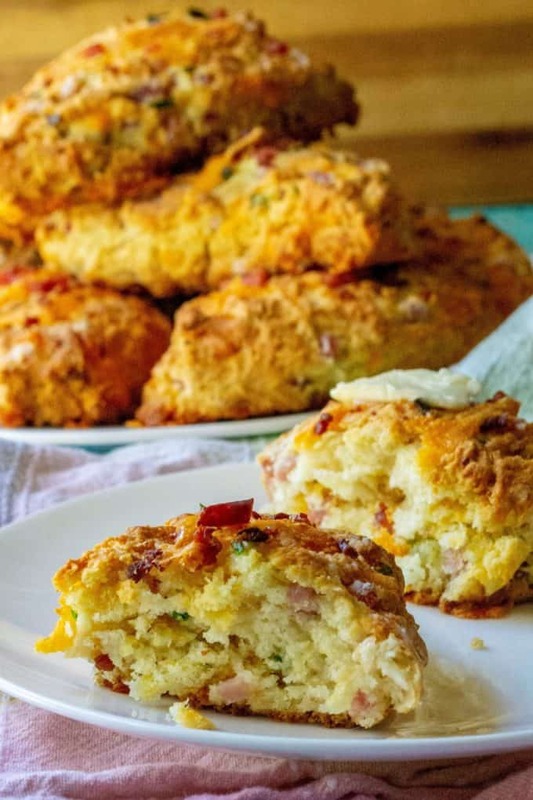 Since these Ham and Cheese Scones are savory, they pair up perfectly with herbed butter, soft cheeses or homemade pestos and flavored cream cheeses. The best part? These scones are not just for brunch!! Make up a batch to serve along side dinner and they are perfect to dunk in soup! Make this easy scone recip ahead of time and freeze them for super quick (or lazy!) brunch prep. Place the uncooked scone wedges on a baking sheet lined with parchment paper and freeze them. Once frozen, place the scone dough wedges in an airtight zip top bag or container and store them in the freezer for up to 2 months. When you’re ready to bake, remove however many wedges you want and place them on a lined baking sheet, brush with an egg wash and bake the frozen scones as directed, adding 10 to 12 minutes to your bake time. SECRET TO PERFECT BREAKFAST SCONES? The secret to a perfect scone recipe is super cold butter. Cold butter is what creates perfect scones that are flaky, a bit crumbly, and super tender. If your butter is warm or room temperature, it will melt before baking and you won’t have those buttery layers that are essential to a scone. Avoid working the butter into your recipe with your hands. The natural heat from your hands will melt the butter and you want your butter to be super cold. 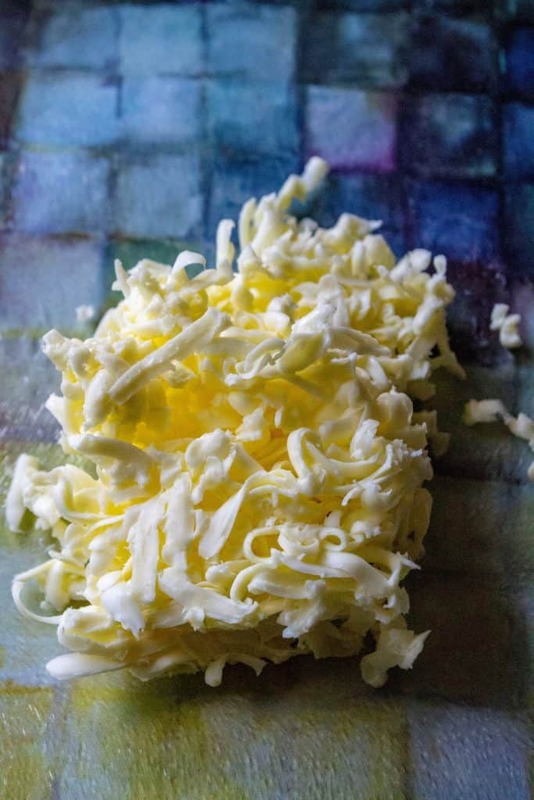 I have tried different methods from dicing my butter with a sharp knife to running it through my food processor and the method I find works best is to grate it quickly on a cheese grater and then pop the butter in the freezer while I chop up my remaining ingredients. Looking for a meatless brunch scone recipe? 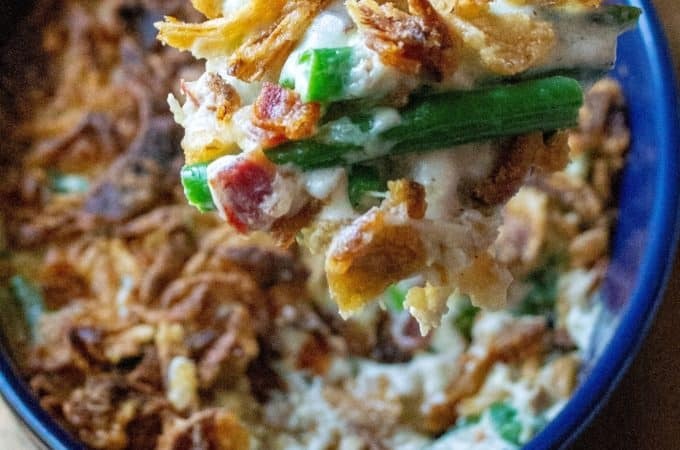 This recipe is completely customizable when it comes to the filling ingredients. 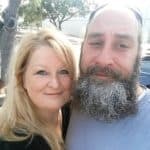 Don’t want to add breakfast meat? Don’t! 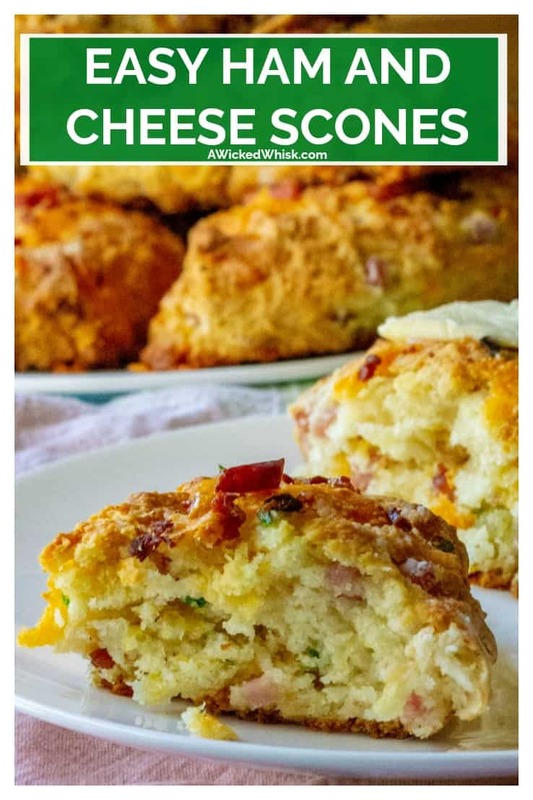 Leave the meat out and make a delicous chive and cheese scone instead. Can these savory scones have some veggies thrown in? Absolutely!! Add in veggies, sun-dried tomoatoes, different cheeses .. experiment to your hearts content. 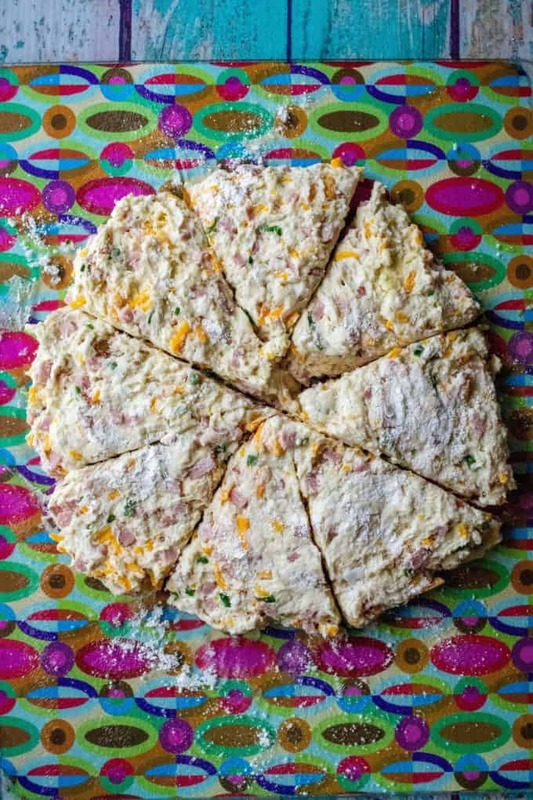 Can these Ham and Cheese Scones be made gluten free? Yes! 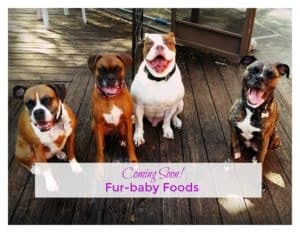 Simply use Gluten-Free Multi-Purpose Flour in place of regular all purple flour in the recipe and add in a 1/2 teaspoon of xanthan gum instead of the baking soda. 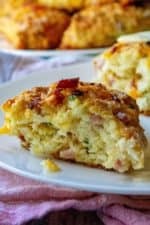 HOW DO YOU MAKE HAM AND CHEESE SCONES? Easy! 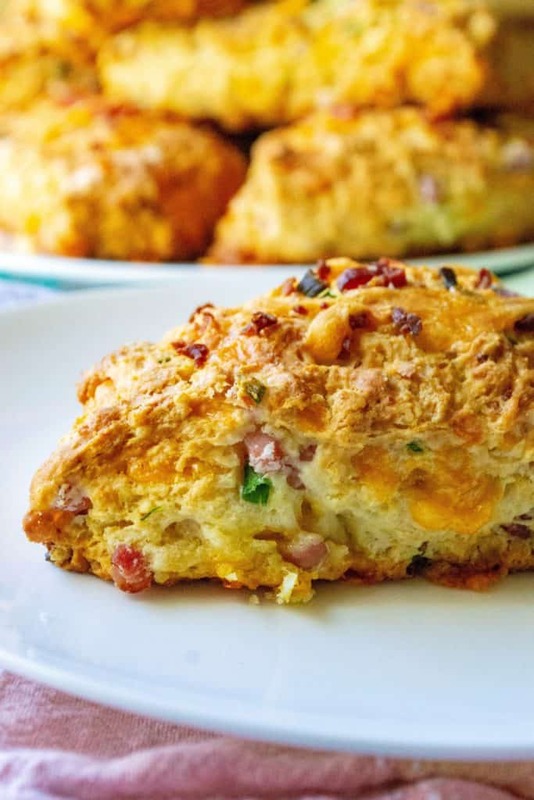 To make these Ham and Cheese Scones, start by adding the flour, sugar, baking powder, baking soda, salt, garlic and onion powder to a large mixing bowl and whisking to combine. 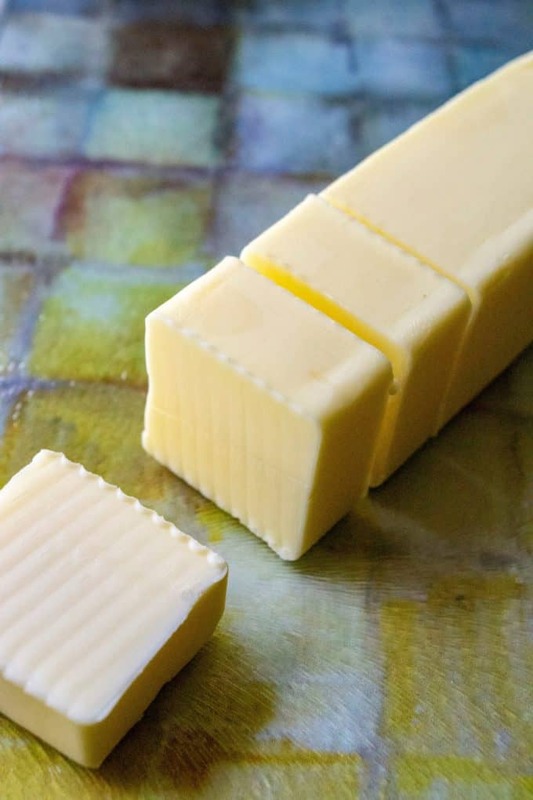 Grab your cold stick of butter and grate your butter on a cheese grater or cut into small pieces and them move your butter to the freezer. While your butter is chilling, chop your ham into bite sized pieces and dice your chives. Remove the butter from the freezer and add to the dry ingredients in the mixing bowl. Using a pastry cutter or a kitchen fork, work the butter into the flour mixture until you have no more large lumps of butter present. Add in the buttermilk and sour cream and mix to combine. 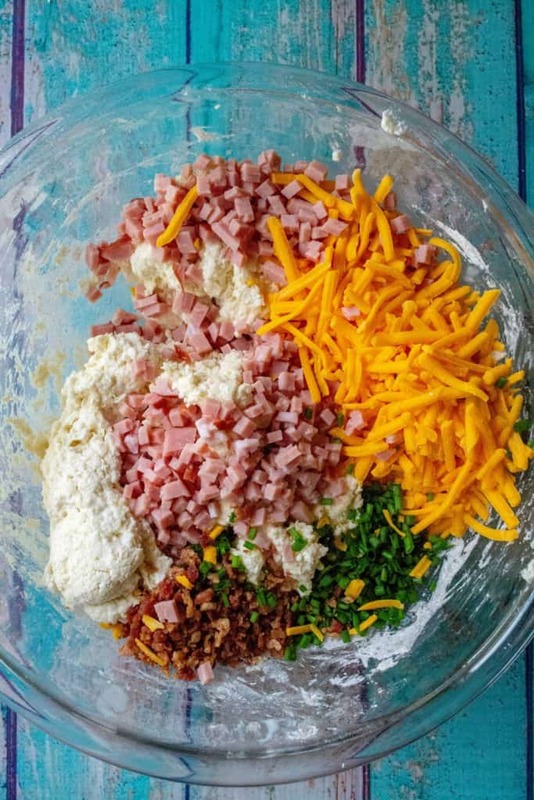 Next, add in the cheese, ham, bacon pieces and chives (save some of those yummy ingredients aside for topping!) and using a large spoon or spatcula, stir to combine. 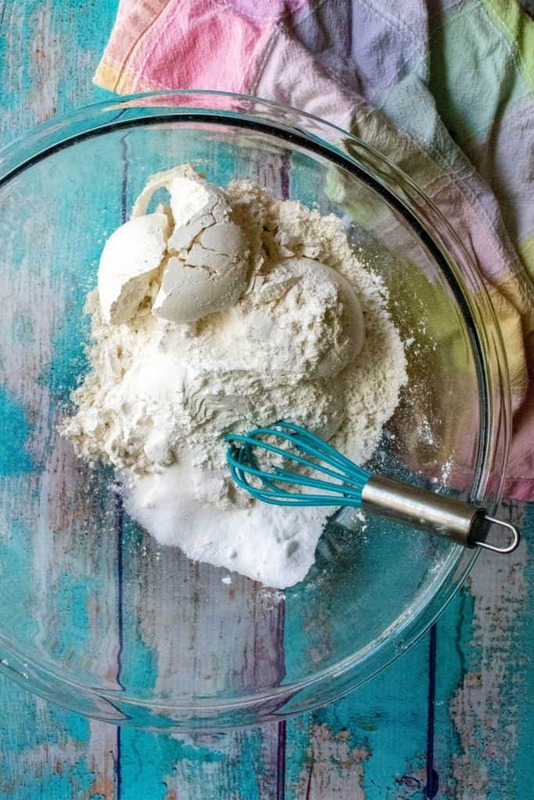 Once mixed, transfer your scone dough to a large floured workspace or a large glass cutting board (my favorite!) Your dough should be a bit wet and sticky so flour your hands. Shape your dough into a large circle about 10-12 inches wide and about 1 inch thick. Using a sharp knife, cut into 8-10 wedges and then using a spatcula or pie server, scoop up the scone wedges and transfer to a parchment lined baking pan and sprinkle with your reserved toppings. Bake for 20 minutes in a preheated 425 degree oven. When done, remove from oven and serve immediately. 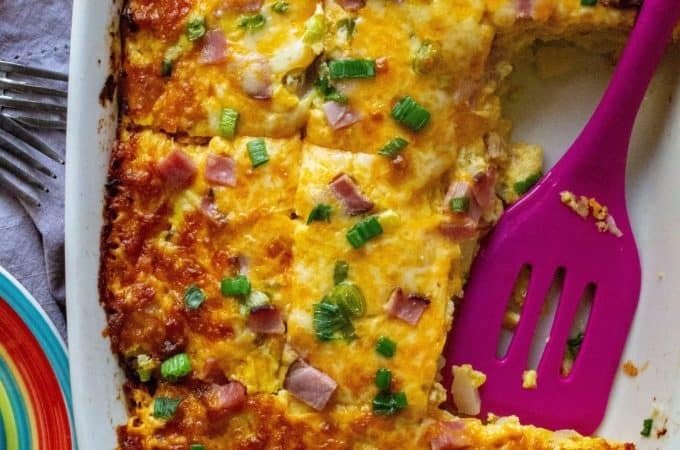 Looking for more easy breakfast and brunch recipes? 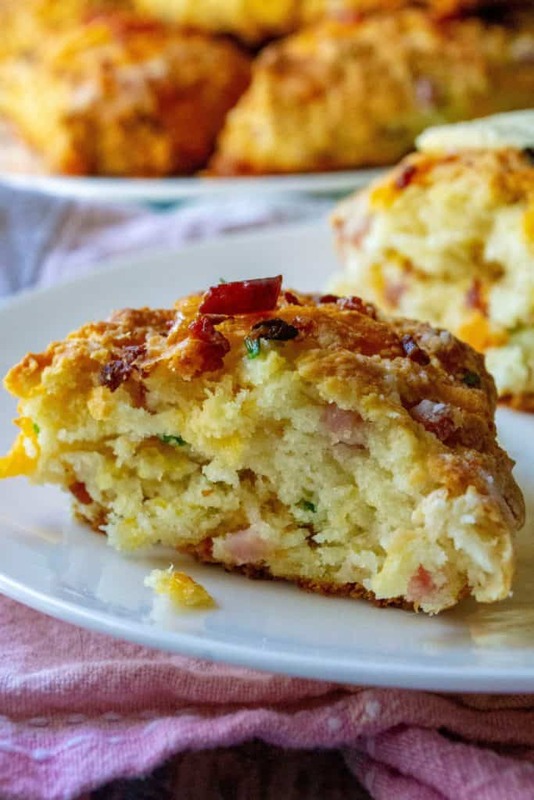 Check out a few of my favorites below..
To make these Ham and Cheese Scones, start by adding the flour, sugar, baking powder, baking soda, salt, garlic and onion powder to a large mixing bowl and whisking to combine. Grab your cold stick of butter and grate your butter on a cheese grater or cut into small pieces and them move your butter to the freezer. 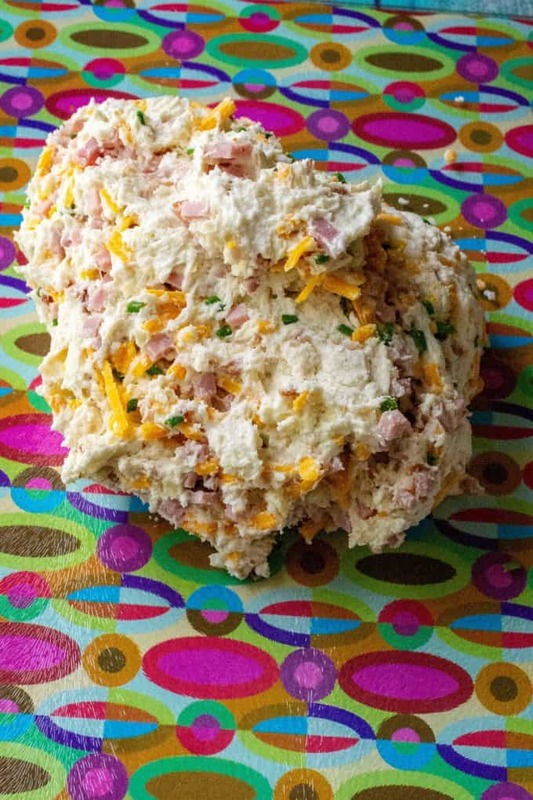 While your butter is chilling, chop your ham into bite sized pieces and dice your chives. Remove the butter from the freezer and add to the dry ingredients in the mixing bowl. Using a pastry cutter or a kitchen fork, work the butter into the flour mixture until you have no more large lumps of butter present. Add in the buttermilk and sour cream and still to combine. 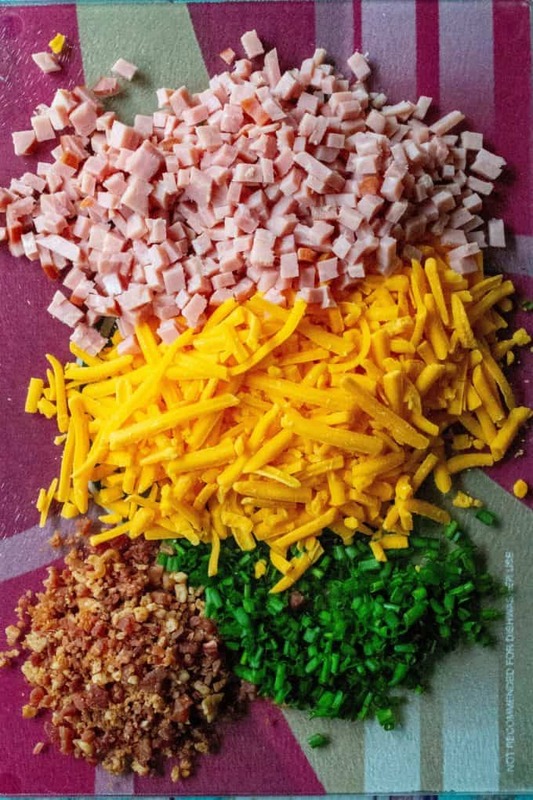 Next add in the cheese, ham, bacon pieces and chives (save some of those yummy ingredients aside for topping!) and using a large spoon or spatcula, stir to combine. Once mixed, transfer your scone dough to a large floured workspace or a large glass cutting board (my favorite!) Your dough should be a bit wet and sticky so flour your hands. Shape your dough into a large circle about 10-12 inches wide and about 1 inch thick. 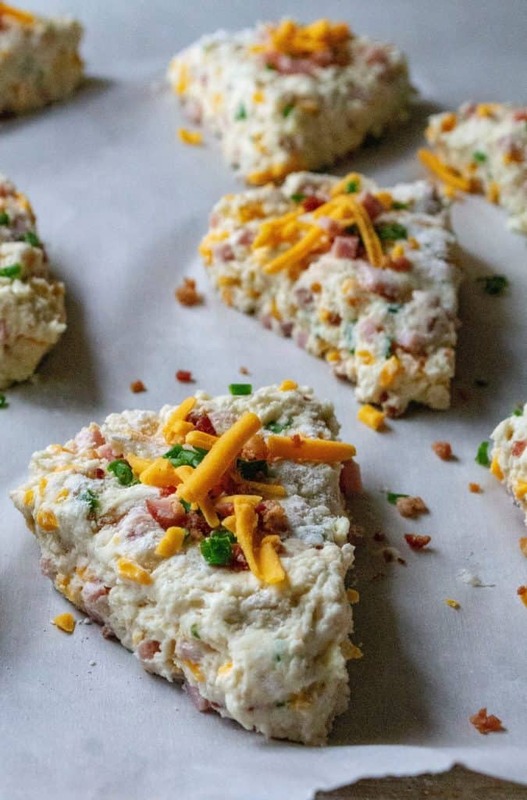 Using a sharp knife, cut into 8-10 wedges and then using a spatcula or pie server, scoop up the scone wedges and transfer to a parchment lined baking pan and sprinkle with your reserved toppings. Bake for 20 minutes in a preheated 425 degree oven. When done, remove from oven and serve immediately. 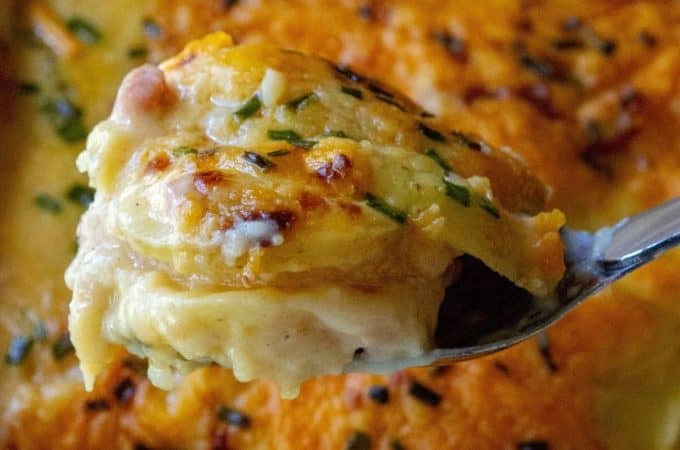 This is an excellent recipe to use up leftover ham from the holidays! I use pre-cooked bacon pieces that are found in the salad dressing aisle of your supermarket. If you prefer to use 'real' bacon, feel free to cook up a few slices until they are crispy and add them diced into your recipe.